1780, Wilkes Co., NC. Jesse TOLIVER fathered a child out of wedlock with Lucy ROBINS. Moses TOLIVER and Hilliar ROUSSEAU posted a "bastardy bond" for the child on June 6, 1780. This required them to reimburse the county should it incur any expenses in supporting the child. Wilkes Co. court records indicate that Lucy ROBINS died in 1787 and her daughter Elizabeth was "bound out" to Thomas ROBINS till age 18 to learn to spin, read, and write. 1787 Tax List, Wilkes Co., NC. JESSE TOLIVER, one poll. 1787 State Census, Wilkes Co., NC, Capt. Noll's Dist. Jesse TOLLAFARO, 1 male 21-60, 4 females. Note: Elk Creek and the Little River are beyond the crest of the Blue Ridge in the part of Wilkes County that became Ashe County in 1799, and Alleghany County in 1859. 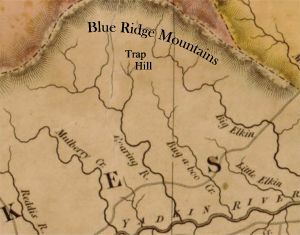 Note: the reference to the New River indicates the above land was located in the part of Wilkes County that became Ashe and later Alleghany County. 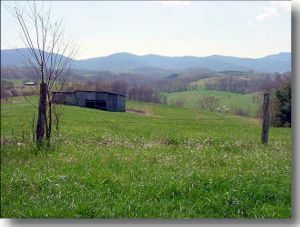 Ashe County was created from Wilkes County in 1799. May 1806, Ashe Co., NC, Court Minutes. "A deed from Jesse TOLLIVER to Joseph DOUGHTON for 100 acres was duly proven in open court by William LEWIS." Nov. 1806, Ashe Co., NC, Court Minutes. "Ordered by the court that Allen WOODRUFF, Francis BRYAN, John WILLIAMS, Adam WAGGONER, Henry WAGGONER, Starling EDWARDS, Nimrod FENDER, John CONNOLLY, Wm. MOXLEY, Abram MILLAR, Jno. BURTON, Cornelius VANOVER, Jesse TOLLIVER, Wm. EDWARDS, Jesse TOLLIVER, Joshua CARTER and James MAXWELL or any 12 of them be a jury to view and lay of a road from HAPPERSON's [HOPPERS?] road between little river and Glad [Glade] creek the most convenient way by MAXWELL's Mill into the road from Elk Spur to the furnace & make report &c."
1815 Tax List, Ashe Co., NC: JESSE TOLLIVER, 600 acres in Captain William's Dist. worth $200, and 2 Black persons. Mar. 1, 1834. Ashe Co., NC. Jesse TOLIVER applied for a Revolutionary War Pension. (NARA Pension File No. W4086.) His pension was granted and he appears on the 1834 pension roll for Ashe Co., NC: JESSE TOLIVER, Private, N.C. Continual Allowance, $55.00 annual, pension started April 4, 1834, age 78. 1840 Census, Ashe Co., NC. Jesse's widow Franky Toliver is probably the female age 70-79 listed in the household of her son Hiram TOLIVER (Ashe Co., NC, census p.8). Note: the following deed executed after the death of Jesse Toliver's son John Toliver refers to some parcels of land originally owned by Jesse Toliver. See also Alleghany County Heritage (Alleghany Co. Hist.-Gen. Society, 1983), p.479.